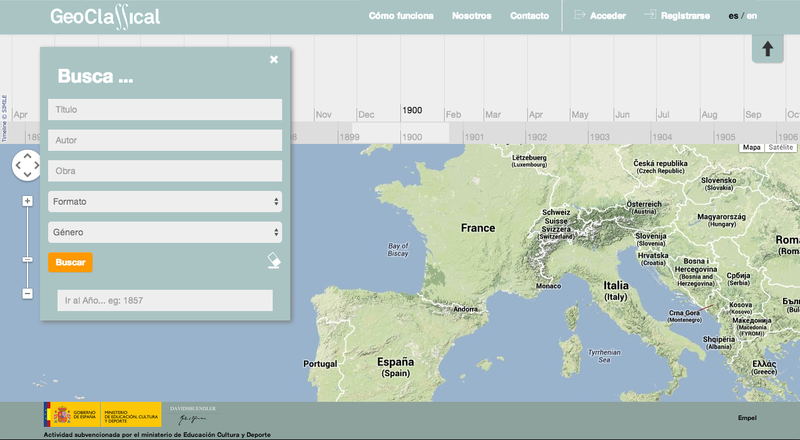 The GeoClassical platform begins its development in 2014 and consists of an open internet application where relevant data concerning the history of classical music may be accessed through the geo-referenciation of this information on world maps. An innovative and relevant tool is added for this referenciation: a time selection bar. Thanks to this tool it will then not only be possible to observe what happened on certain regions of the world, but it will also be possible to display the events year by year, observing the evolution of the fields selected on a specific search. This project is co-funded by Davidsbuendler and the Spanish Ministry of Culture (INAEM) and is being currently developed by Empel Networks. Through the integration of musicologists to our staff, Davidsbuendler is building a large database with relevant historical data, while the collaborations with leading institutions in the field of musicological research worldwide is made. The beta version of this application will be available from the second half of 2014.